Bleeding edge specs are good and all, but what matters most is the overall immersive experience one can get from games and movies. That fact is why curved monitors have risen in popularity along with the gaming grade peripherals we have today. Inevitably, traditional manufacturers would introduce products which have these characteristics melded into one particular model to cater to a growing population of consumers for this niche. Samsung, a famous manufacturer of pioneering TV models and outstanding consumer monitors recently gave birth to the Samsung CFG70. This product is a 24-inch (Also available in a 27-inch variant) curved gaming monitor with a 144hz refresh rate, 1ms response time, and an excellent contrast of 3000:1 and outstanding color reproduction thanks to its quantum dot backlit VA panel. This product certainly is an exciting addition to a rather limited but steadily growing line of curved monitors aimed at consumers looking for a different viewing pleasure other than what conventional displays offer. You can also check out our review of HP Envy 27 4K. Samsung isn’t widely known to produce gaudy monitors with lots of bling or color schemes, so this product has a textured matte black plastic cabinet that exudes a mainstream professional look while disguising its cutting edge capabilities. Even the bezel surrounding the VA panel does not look similar to those found on other gaming-oriented products since it isn’t as thin and does not include any accent or decoration. The CFG70 is quite a stand-out in this aspect, considering it looks subtle when compared to the conventional gamer designs. But cleverly hidden in its overall contemporary look is a LED strip which Samsung calls the Arena Lighting, which can be controlled to display a breathing or pulsating blue light. Its actual usefulness is quite questionable, except to light an unilluminated keyboard or desk space. Although I found it quite entertaining that Samsung did not forget to add a fun but subtle mini feature, despite the minimalist design. The stand this product features is of a unique design which Samsung calls the Dual Hinged armed design. 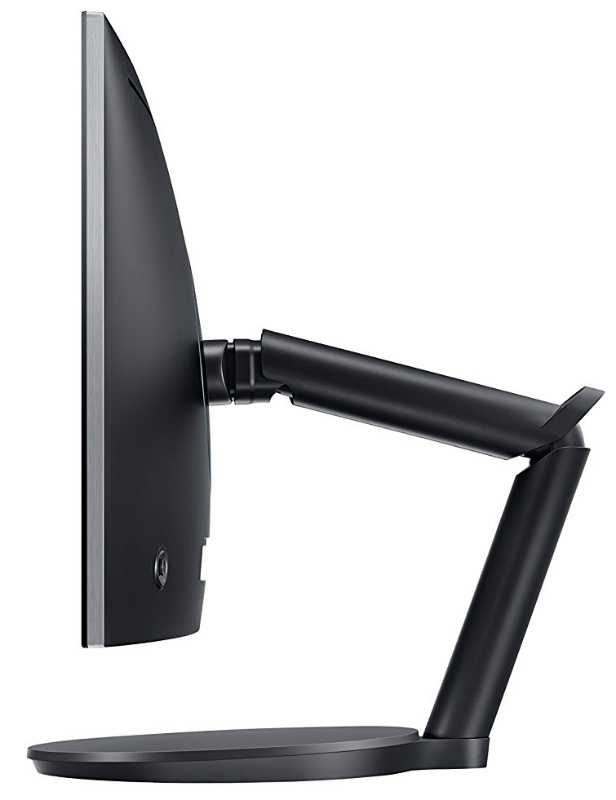 At a glance, it looks like a robotic arm more than a display stand. The display itself has a limited tilting range, but this mechanism provides a versatile variety of adjustments typically found on mounted monitors. Movements are smooth, and the arms hold in place firmly enough, but one common complaint is that the screen seems to wobble even with minimal or indirect force. Even a swipe of a mouse or heavy typing shakes the screen, which can provide a purpose-defeating downside or worse, nausea and headaches. You are considering this product, make sure your desk is sturdy enough not to induce further movements or shakes. Despite this flaw, the design for the stand further adds to the professional look the product displays, making it a suitable addition to a studio or an office. The base is also another point of complaint, as it takes up a lot of space on a desk, but stable enough to keep the whole product together. The stand is also VESA compatible so you can easily replace the stock mount if it proves to be unreliable. One can find an acceptable number of connection options including HDMI and DisplayPort located at the back of the cabinet. There are no USB ports for additional peripherals, which would have found a beautiful spot on the huge circular base. This absence is not a huge or significant loss, but for what Samsung expects consumers to pay for this offering, adding these receptacles would have further justified the price tag. Samsung also did not include speakers to the package, since most gaming setups have skull-numbing headsets or larger than life speakers. Not a big loss either, but leaving something as meager as built-in speakers can cheapen a cutting edge product. Finally, one of the notable physical features of this product is its OSD navigation keys. Samsung placed three sizeable buttons hidden under the bezel and a tactile joystick at the rear panel on the bottom right side. This controller also doubles as the power button and is typically found on higher tiered products such as those from Asus’ ROG Swift line. The company states that their OSD has a game-style design, so the menus are responsive and large enough to be seen clearly. It can get confusing to access features at first because of the separation of these controllers, but once you get used to them, convenience will ensue. The main selling point of the CFG70 is its Quantum Dot VA panel curved screen. The combination of the two technologies creates an accomplished product with exceptional contrast, color accuracy, and saturation. VA panels are also the middle ground between TN and IPS, so in tests, there was virtually no backlight bleed while the image performance of the screen was also superb. Since this product is capable of a 125% coverage of the sRGB color space and around 70% of the Adobe RGB, color representation was rich and fairly accurate. Samsung did quite well to build this monitor with the tech mentioned above. Grayish hues are absent from the image, and blacks and shadows appeared solid while color transitions between shades were also decent. Performance out of the box can be considered superb, but a little tweaking could help you in finding a sweet spot since appreciation of these different aspects of the image may vary between different viewers. There seems to be one little flaw in the form of light leaking from the corners of the screen, but this is inherent to curved monitors and also quite hard to notice. These performances looked beautiful on the curved display, but these positive points would benefit from larger resolutions or aspect ratios (Especially the 27″ version). The immersive feel of this display type is also subjective, but to be fair, your eyes seem to be a lot closer than it is on regular panels, so there is a level of connection between the picture, the inputs and the user. Aside from the excellent imaging performance, this monitor is also capable of a rapid 144hz refresh rate with minimal response time, so in demos, games did look fluid, and the product performed like a gaming-oriented offering should. While images were vibrant and crisp, there was little to no blurring or artifacts, and the controls feel better connected to what was happening on screen. These results were on tests with constant high FPS, but for situations where the framerates dip, the CFG70 also comes with Freesync tech. This tech is particularly useful with graphic intensive games such as Tomb Raider or Battlefront. This certification also allows for more connections compared to G-Sync, so this is indeed a welcome addition to the product’s spec sheet. Inducing Freesync into operation, induces additional input lag, although barely noticeable, Samsung programmed an Input Lag mode into the OSD to compensate if delays become apparent. The OSD also contains options to customize your experience further. The native refresh rate can be controlled in increments, from 30hz to 120hz. Checking your FPS performance and selecting a locked preset ensures better image stability without the help of Freesync. There are also several presets for each gaming genre, but for a concise and informative review, we will not go into the details of each since the out of the box performance, or tweaked settings fare better and are preferred. Still, the inclusion of varying options is a healthy addition to an already capable product. 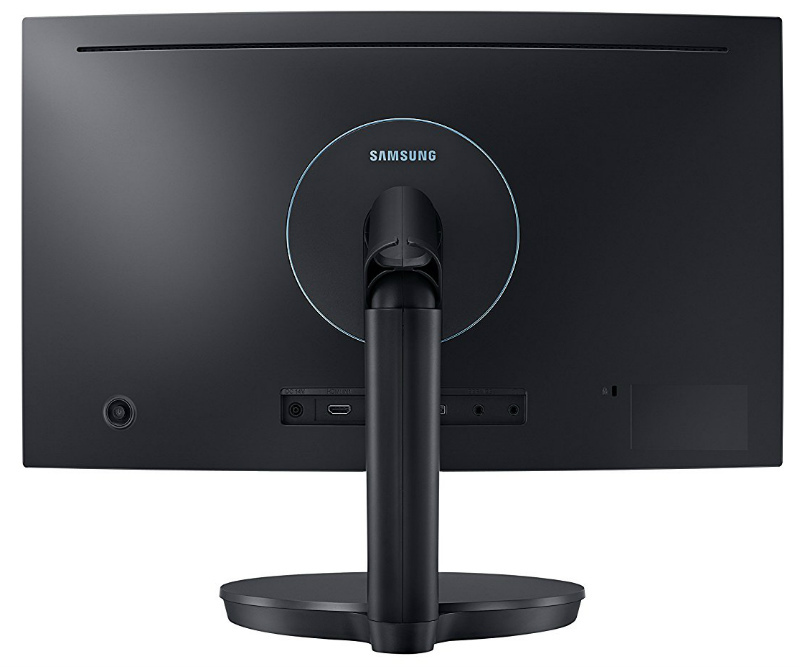 While appreciation of a 16:9 curved monitor is on a case to case basis and is possibly subjective, the Samsung CFG70 certainly will not disappoint prospective owners. Color, contrast and speed performance are either up to par or even better than what most available gaming monitors can do, mainly due to having a Quantum Dot backlit VA panel. Samsung is famous for high quality, superbly performing display products, and they certainly do not disappoint with this model. They did, however, drop the ball on an important part of the monitor; the flimsy stand. While innovative and flexible in offering easy of adjustment and good articulation, fearing for your display’s dear life while the whole thing wobbles with only minimal force is a quite disturbing for regular day to day use. Buying an aftermarket VESA mount may be in order, but that will add more cost to the already high price tag. For a 1080p monitor, asking $350 (24 Inch) or $450 ( 27 Inch) is too much despite the great performance this product is capable of. There are better options for the money out in stores, although most of them do not have curved screens and quantum dot tech. 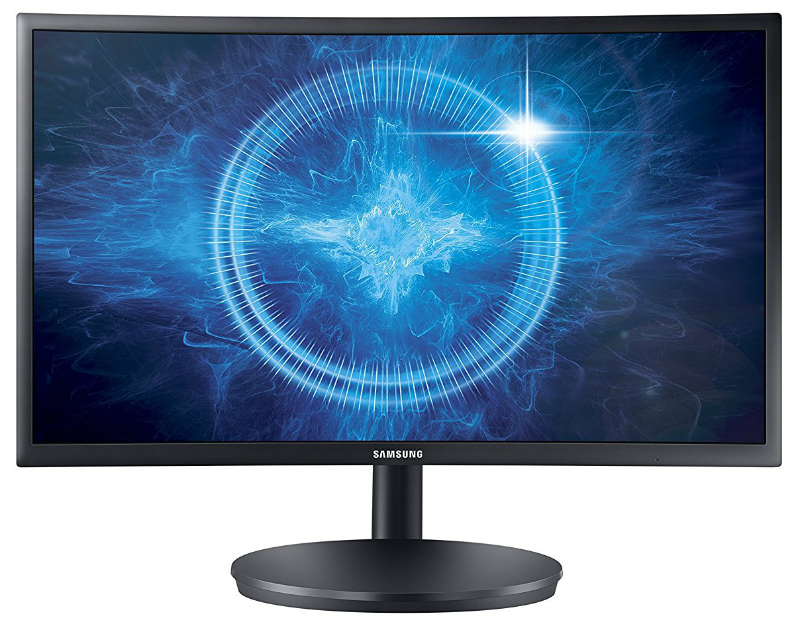 If these features and their benefits appeal to you or if you can readily swap the stock stand with a better one, then you can consider the Samsung CFG70 a good buy, since it is a better performing and beautifully stunning 24-inch option than regular 144hz monitors your hard earned moolah can provide. Can I purchase a replacement base stand for this model as mine has snapped and I can’t see VESA holes on back of screen! Hey, Tracy! 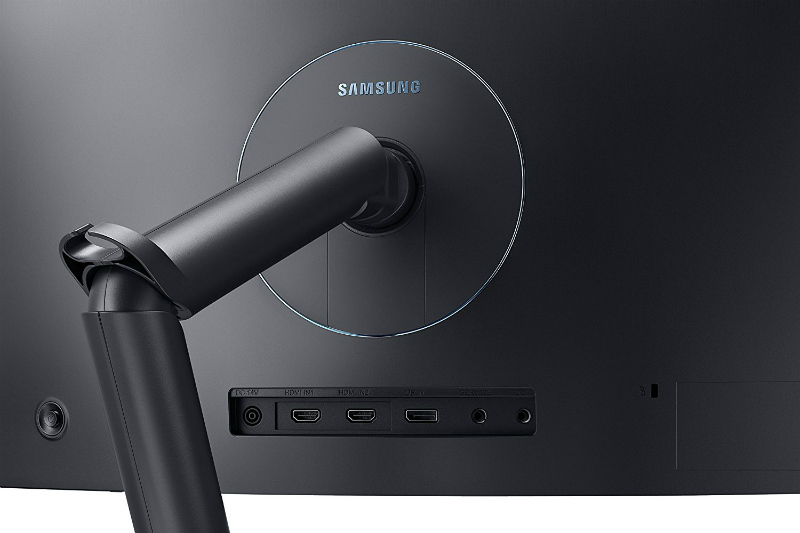 The Samsung CFG70 monitors ship with VESA mounting plates included in the package, so you can use aftermarket stands with it. Check your box to see if its still there. You missed an important point. You mentioned that it takes up alot of space on your desk but dint mention how much. If you would have mentioned the exact distance it consumed from wall, then it would have given readers an idea exactly how big a desk they should have inorder to own this monitor. Hi, Isfakur! The specifications on the review include the product dimensions which lists a total depth of 15.2 Inches, which is double of what most monitors of the same size consume. Hope this helps. I have this exact model, bought it like 1 week ago, but I can’t find the 144hz option in the refresh rate menu. It only appears 60, 100 and 120 hz. Also I have no signal when I connect the monitor using display port. So I’m currently using hdmi and 120hz. Any ideas? Hi, Vasco! It’s highly unlikely that your DisplayPort is malfunctioning. Did you select it as the primary option in the OSD as well? As for 144Hz operation, the two HDMI slots are version 1.4a, so they can only support up to 120Hz. If you do get DP to work and the 144Hz option doesn’t show up, you can try creating a custom resolution via your Nvidia/AMD control panel. Good luck! Thanks for the help, I’ll try to get this display port to work and I’ll reach to you after. I had the weird blue pixels over black areas bug once after playing on the monitor for several hours as well. It disappeared after turning it off & on. I think your main criticism of the stand being wobbly is rather unfair – it’s dependent upon how level & sturdy your desk is. I have tested it directly on my desk & with it on a monitor riser. My old monitor (28″ year old Asus) was not adjustable & way too low sitting directly on my desk, so a short bamboo riser was perfect. My old monitor wobbled on my desk & the riser, because it was top heavy & had a narrow base. The CFG70 is so heavy & evenly distributed, it doesn’t budge on either. I have a few personal minor gripes. The Arena Lighting is not customizable enough & poorly utilized. You either have it off or sound reactive, no always on or brightness setting. The only way it will activate is for headphones or speakers being plugged into the auxiliary jack in the awkward back of the monitor. Like many people who love playing video games, I have a nice headset – it’s wireless with 7.1, but not through an auxiliary jack. So, the Arena Lighting remains a nifty but unusable feature. The second is kind of take it or leave it, & I chose to leave it because the monitor is so good otherwise, is there is no G Sync version. Yes, it’d be more expensive & it’s not a must have feature, but I would of bought that version if it were offered. Hi Lauren, thank you for your valuable insight. We have heard of the pixel issues on the CFG70, and we have yet to hear from Samsung or come across a solution. Our opinion of the wobble is based on several other monitors we have handled for comparison, but it could have been a quality control issue if the difference really is that severe. We do agree that there should be a G-Sync version, and if there was I would personally purchase it too for gaming at home. Hi There. When evaluating this monitor, did you notice that contrast improved when using 144hz? I have one of these and If I run it any lower than 144hz I lose a great deal of contrast (it is more washed out in lower hz, which doesn’t make sense to me). Have you noticed anything like this? I’m using it on a DP connection with a GTX 1060. Hi, Phillip! Thank you for taking the time to read and comment. During our time with the CFG70, we did not notice any drastic changes in the contrast to cause additional testing. But in your case, it may be because of how each person’s brain interprets the images the eyes see. Since the higher refresh rate can render a larger number of frames, it is possible that the gradient changes in lighting and in color are better detailed when compared to a 60Hz monitor. Your Experience is probably similar to how Frame Interpolation works on TVs. It’s a method where the system inserts an additional frame to avoid blurring, and since colors and shadows transition in each frame, you also get better contrast depending on how your brain can process the picture. I have had problems unmuting the monitor. It seems that the key on “mute” is stuck and I have not been able to hear any sound at all, even though when I test it the sound bar shows signs of life (but no sound). The sound card is of good quality and it was working perfectly well on my previous Samsung monitor (SyncmasterP2370HD). I did test the sound on three different speaker systems, all with the same results. Any ideas? The problem seems to be caused by the monitor itself. I suggest that you request for a new monitor. I would like to know what is the minimum brightness of white. If they will make it 29″ 2560×1080. I will instabuy it. Hmmmm, did you really review this monitor your self’s? Why i ask is because the review is a little light on details, details that a TRUE Monitor Nerd would NOT leave out. Like what version of DisplayPort and HDMI is the monitor equipped with. Heard rumors that this monitor is equipped with DisplayPort 1.3, is this true? If it has DP 1.3 then this piece of news is very important since most true Monitor Nerds have been waiting for DP 1.3 to show it self in a commercial product for about two years since DP 1.3 was finalized as a standard. Hi, Robert. Thank you for taking the time to comment. The CFG70 still has DisplayPort 1.2 unfortunately, and version 2.0 for its HDMI slots. I apologize for overlooking this important detail in the review, and thankfully we have readers like you who make an effort to share critiques with us upon reading what we have to say about an individual product. We do take these feedback seriously and treat them as constructive comments to improve our work further.